We have a fantastic selection of Zanussi Fridge and Freezer spare and parts. Choose a part type like Baskets, Door Handle, Drawer and Hinges or from popular Zanussi Fridge and Freezer models including Zanussi 02-800953, Zanussi 081509, Zanussi 081510, Zanussi 119R and Zanussi 519093. Genuine spare part suitable for selected Electrolux, Firenzi, Aeg Electrolux, Tricity Bendix, Zanussi and Zanussi-electrolux fridges and freezers. Genuine spare part suitable for selected Zanussi and Zanussi-electrolux fridges and freezers. Genuine spare part suitable for selected Zanussi-electrolux and Zanussi fridges and freezers. This item replaces product numbers: 531011601329, 2236264012, 2061766016, 2270068014, 2061766008. Genuine spare part suitable for selected Zanussi-electrolux and Tricity Bendix fridges and freezers. 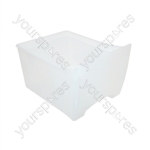 Genuine spare part suitable for selected Zanussi fridges and freezers. Genuine spare part suitable for selected Zanussi appliances. Was exactly what I needed for my Electrolux ERU14410 integrated fridge. It took 20 minutes to change the hinge. Only tools required; a screwdriver for the hinge and a spanner to remove the decorative door front. It arrived within the advised time scale.